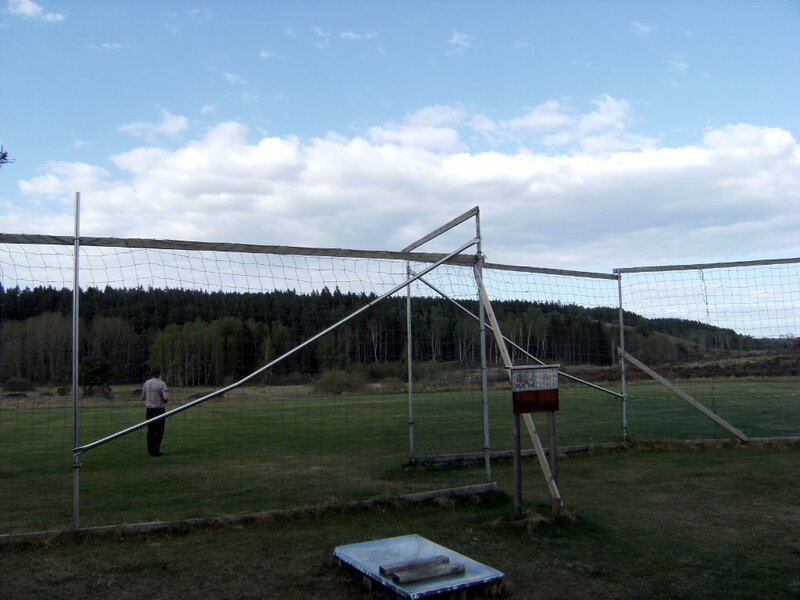 I was honoured by being invited to Balltorp field as a guest flyer. I could do my maiden flight there. I took my 2 keychain cameras (fixed on the plane) and my hat cam. The maiden was divided in two parts actually. HaBoRC kindly offered me to have an instructed maiden and a demo before I do my actual maiden. As I was way too excited to fly I was glad to follow his instructions. 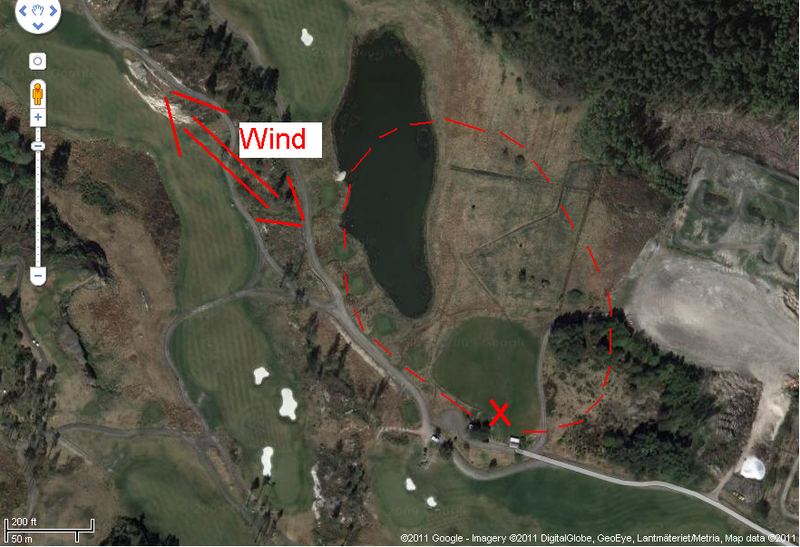 We had an average wind with some sudden gusts, you can see the direction on the map in the video. First HaBoRC checked the CG balance on ground. Was okay, I set it as good as I could. Then he took the plane up in the air and checked if it needs trimming. It was difficult to tell due to the wind, but looked neutral. Then he checked if the plane is easy to land and drove around with it several times so that I can see how it reacts, how the sight changes with distance, how it “feels” up there. As he made some rounds I got calmed down (somewhat), and then we gave it a try. I could choose between two options. Either HaBoRC takes off and handles over the radio in the air or I just take off myself. We took one round with the first option for the sake of safety. I landed the plane in the bushes at this point, drove it in the wind (against wind direction to minimise ground speed) and then “dropped” it from 1.5 meters into the higher grass. 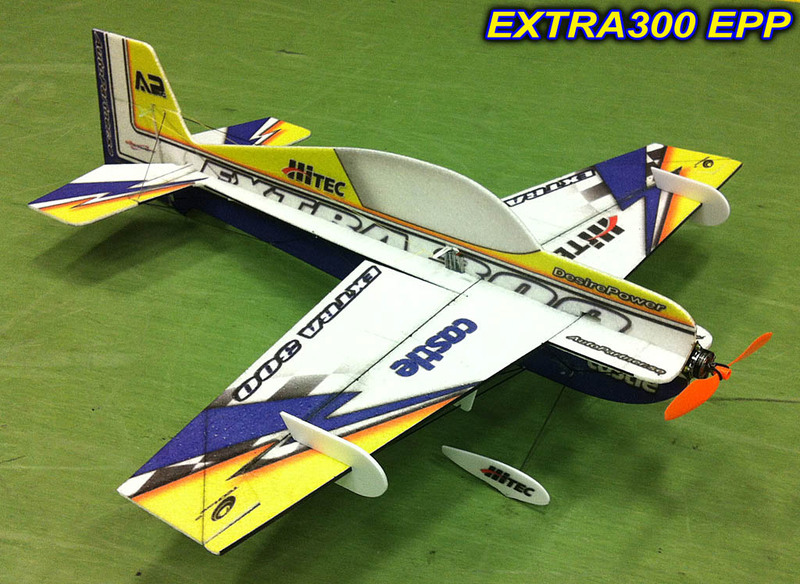 With a foam plane you can do that unless you do it from higher altitude. No damage on the plane, this time I did not dare to land on the real landing area. So unless you fell asleep in the first few paragraphs you can see that my maiden was actually several maidens together. The one that you see is a semi-maiden, I gained some bravery and went for it. This time I aimed for a proper start and a proper landing. I was extremely cautious with the wind. My fighter plane simulator experience echoed in my head along with the comments from HaBoRC. You have 2 types of energy. Height and speed. You can convert one to another. Unless you are low on both you are mostly okay. If you have height and lose speed you can always convert some height into speed through diving. So I tried to fly somewhat higher and medium throttle. 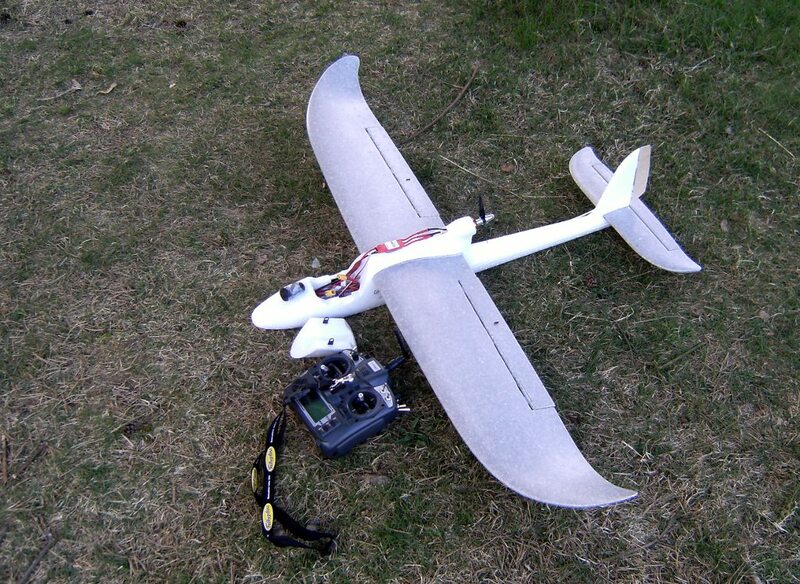 I have a 2200 kv motor in the plane with a 6×4″ propeller, this delivers insane power at full throttle. So I had reserve there. The bottleneck is my inexperience and my lack of control. The control: what needed setting up was the radio actually. I needed to dial in some expo, so-called exponential setting. This makes the center of the yoke movements less sensible, you can control fine movements easily, there is no worry for hard inputs. And with full deflection you have full control surface action. I added 33% on all controls and 20% on aileron due to wind gusts. 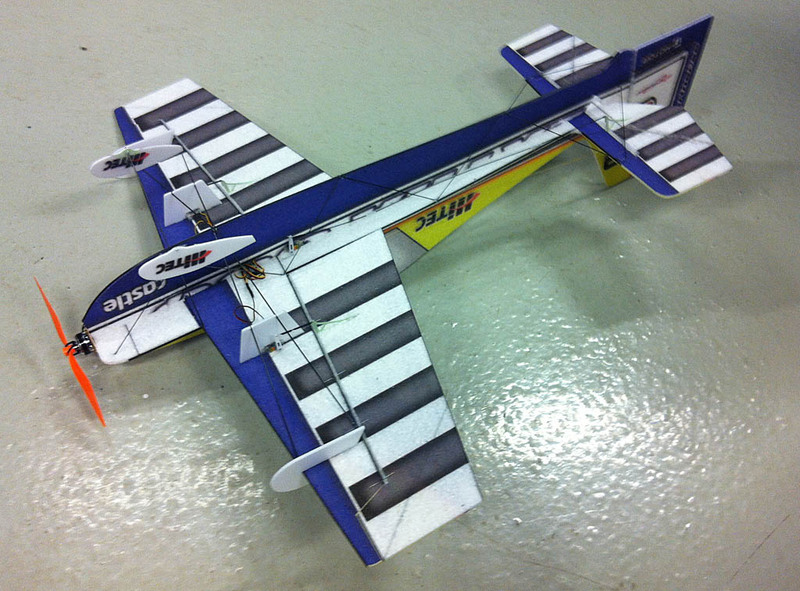 So I had less sensitive action on elevator, rudder, but a bit more sensitivity on aileron. This helped a lot as I explain it with my funny language. I took several flights, 5 in total. Practiced round flights, some 8-figures and tried to turn left and right. 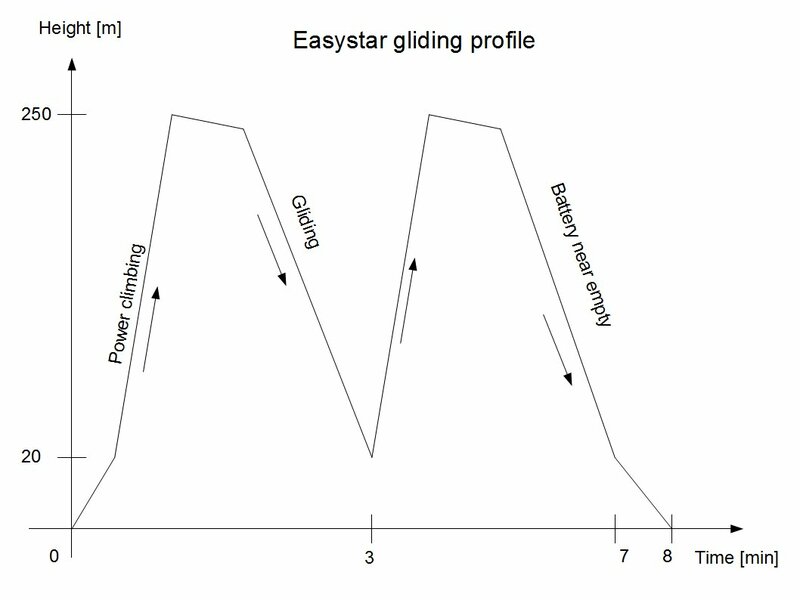 The Easystar glides so well that I needed to extend my turns above the small lake so that I gain more length. Otherwise I glide over the whole field and cannot slow down. Later the wind picked up and I almost crashed into the depo area. That one was tricky, I flew against myself and then I had to save it with low altitude and close distance to the obstacle. The camera doesn’t really show the distance due to the 28 mm wide lens setting but it was close enough for me. This time I landed and decided that it is going to be enough for the day. I flew 5 rounds, gained amazing amount of experience and had great fun. I need to keep up the practicing, I need to have same respect towards the wind and the plane, I think. Thanks again for the great instructions and the possibility for the flight as a guest. Maybe it is time to tell about my recording platform. Calling it recording platform is maybe an overkill. I use my camera tripod, an older Manfrotto 190DB tripod that is similar to this one. As a camera I use my wifes small digital camera, a point&shoot category Fuji F480 camera. It can record 320×240 pixel clips with 30 fps. Not a very capable camcorder, however it features an equivalent focal length of 28 mm in wide setting. This is good for indoor shots. As long as I don’t have anything better I use this camera. It gives nice recording if it has enough light, outdoor shots are quite nice. Back to Lama flight. I tried to improve my skills and learn how to hover. This looks the more basic thing but is also the most difficult. It requires to find the perfect balance between forces acting on the helicopter. Even if the heli is stationary it requires constant control input. What control inputs do we talk about? There are 3 main control items on a helicopter. You have cyclic control, this tilts and banks the heli in all directions along horizontal plane. Then you have collective control, this is height basically. To complete you have pedals for controlling yaw. On a helicopter whatever you do with one control all (!) other controls need some complementary input. Let’s say that you want to just go forward from hovering. First instinct would be to press forward cyclic and hope for good luck. This will result in the heli banking forward, then loosing altitude gently while it picks up speed in forward flight. If you don’t want to lose altitude (for instance there are trees or houses around) you want to “get more engine power” and add some collective. Let’s assume that the engine control compensates for this action and we don’t consider now engine RPM. So you add some collective to compensate for height loss as you transition from hover to forward flight. We would think that this is perfectly okay, we have the heli under control. But we have to cope with yaw control. 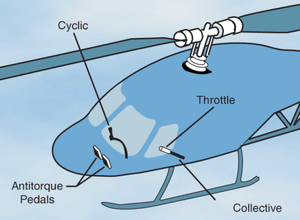 As the main rotor rotates it generates torque that needs some countering force. Tail rotor does this, it counters torque coming from main rotor. As the RPM of main rotor changes we need to adjust what amount of thrust we generate with tail rotor, otherwise the helicopter will start to rotate along its Z-axis. I think a visual illustration makes it much easier. Mikey’s RC has several great tutorials. A good tutorial from Nightflyyer. As I started with a simple coaxial heli I had little easier, the behaviour of a coaxial heli is much different of a collective-pitch helicopter. To illustrate how they fly I could say the following. A coaxial heli is more like “hanging” on its rotors, it always want to return back to vertical. A collective-pitch helicopter is more like “balancing” on top of an invisible air cylinder, it tries to “fall off” this cylinder, tries to escape balance all time long. As a beginner coaxial is more practical. You don’t really have to care about maintaining the helicopter in the air, you can concentrate on flying it. How difficult it can be after all? It is still quite difficult. Even though that it is stable in flight, you are still drifting around in air. If you start to fly forward it is drifting on an invisible cushion of air. If you want to stop forward flight you have to decrease speed and try to stop. If you give too much input you will drift backwards. And there is always some amount of side movement, that you have to keep track of. For me flying was very challenging and a lot of fun. I managed to find the right balance of challenge and excitement, I could still enjoy flying and get the blast of challenge that pushed me towards exploring more. Here is how I managed. You might ask some question. Like why do I slam the heli to the table? Why do I land so poor? To answer this I have to refer to my inexperience and to ground effect. When you are flying low with a helicopter you gain lift compared to flying higher. Approximately at a height of rotor diameter this starts to be noticeable. As you get into this ground effect height you have to decrease throttle to maintain altitude. When you get above this height you have to add some throttle to have same altitude. If you are inexperienced you can have same problem as me, you just cannot handle throttle as needed and get into some oscillation of height. Practice helps. At the end of the clip I crash even. This was my first crash being recorded. Some explanation here as well. When you crash a fixed-pitch helicopter (or you can see that crash is imminent) it is actually better to take away throttle and just let it fall down than trying to save it and max the throttle. This might sound crazy but is true. On a fixed-pitch helicopter you have very basic rotor head, very little amount of moving parts. They are quite durable and easy to fix. A collective-pitch rotor head looks more complicated. If you crash the rotating blades struck some object and cannot rotate any more. If you add throttle during this the motor still tries to rotate them but they are blocked so something will let go. Either the blades crack and/or the motor burns down (or you crack some cogs). As these helis are so durable crashing from 1 meter height will probably not cause any major damage. In my case the flybar weight popped out of its place, this can be popped back and I was ready to fly again.